Im new here, have been searching quite a bit on somthing I find very interesting, the Carlton Hill Station on the Erie Main Line. Im very familiar with the Rutherford train station. Ive been pulling down all the old maps I could grab from Wikipedia, etc., trying to fully understand the way the rails used to go and got aligned. See, my familiarity has always been that the train came from Hoboken (I get that from Rutherford it originally went to Jersey City, but changed to Hoboken after the E-L merger), and then just past the station, curved and went off towards Suffern. These days that is known as the Bergen County Line. There was always a curiosity in my mind, which I only learned enough about over the last few days, as to why though NJT curved off, there was a rail line (that sometimes saw freight) that stayed straight and ended at the Passaic River. I get it, kind of. This was the Erie Main line originally. It went off to Passaic, then Paterson, Ridgewood, onward. The original D,L&W line is what NJT also calls the "main line", but it was the DLW main line. So the main line and Bergen line services now on NJT are really a combination of what was the Erie Main line and the DLW main line, right? But what Im failing to see is the way things were before all the alignments. then my take away is that the ORIGINAL Erie railroad would be drawn if one was to essentially straight-line connect from Jersey City through Patterson (which actually connects through Rutherford and falls straight along the trackage that NJT shows from just past the curves by seacaucus junction to the curve just past Rutherford. The thing that confuses me though, is the description from Wiki on Carlton Hill. "After the merge on October 17, 1960, between the Delaware, Lackawanna and Western and the Erie, the city officials in Passaic once again brought back the possibility of removing the tracks through Main Street, Passaic. This time, the newly formed Erie–Lackawanna went forward with it, beginning the process to move its main line onto the former Boonton Branch and Newark Branch through Lyndhurst, Passaic and Clifton." However, if we look at maps of the Erie and the DLW railroads, it appears to me that the Boonton Branch was actually the DLW main line that went through Kingston, Lyndhurst, etc. But this conflicts. The train line that goes through Rutherford is the Bergen line, not the DLW Main Line that would have gone through Lyndhurst and Boonton. At some point, Erie lines were shifted from Jersey City to Hoboken, OK, I get that. Carlton Hill Station was EOTL when the lines through Passaic got shut down. Rutherford station was always a station stop regardless of track alignment at the Passaic River. 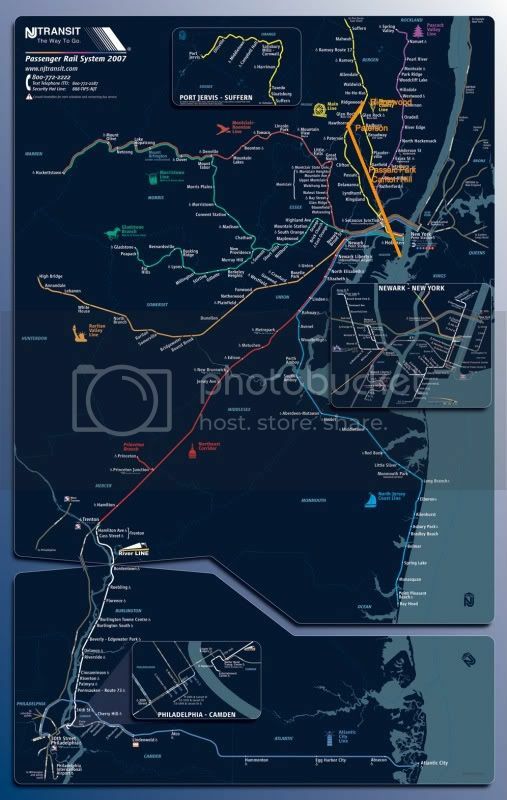 So, that said, was the "curve" in the track that aligns the Erie Railroad through Rutherford as it is currently shown on the NJT maps (Through Garfield to Glen Rock, before going on to Suffern) put in after the closure of the Passaic River bridge, which forced Carlton hill to be end of the line? Or was there yet another line that always split in Rutherford, past station square, which was an alternate to the Erie Main Line that passed through Passaic? That is the intent of this long-winded first post, to understand what the Erie stations truly were (tough to grasp off of Wiki), and how they were set up through Rutherford, given that the Erie Main Line always went up to Suffern, and the claims of Wiki that traffic was diverted to the Boonton line could not be accurate, since that was a different DLW line that still to this day has distinct trackage that DOES NOT go through Rutherford Station. Phew. Hope that is understandable. Would love to hear any insight that anyone might have. I hope to grab some pictures of what is left of the Carlton Hill Station ruins this weekend. You are more or less right. The NJT Main Line is actually the original Lackawanna Boonton Line south of Paterson Jct. (under the Garden State Parkway). The section between there and downtown Paterson is the former Erie Newark Branch. The Bergen Line is all ex-Erie, with the old Main Line running off at the Carlton Hill spur. During the 1963 realignment, the Boonton Line was rerouted onto the Erie Greenwood Lake Line up to Mountain View and west on the Boonton Line. The Erie Main Line through Passiac was abandoned in favor of the Boonton Line routing. Maybe you're confused about what the Boonton Line was before 1963. What NJT now calls the Main Line runs on the DL&W Boonton Line from West End 40.7408N 74.0650W to about 40.8865N 74.1671W where it follows a DL&W branch/spur to the Erie Paterson station. You know where Carlton Hill was, and you know where the Bergen Co line is now, and you're wondering was there something more in Rutherford... no, there wasn't. timz wrote: to about 40.8865N 74.1671W where it follows a DL&W branch/spur to the Erie Paterson station. The post 1963 EL "Main Line" was the old DLW main line up till about under the GSP, then it followed old DLW siding/yard ROW curving to the right and joining old Erie Newark Br, just west of what is now Patterson Jct. It was all single track/old newark br from there up to patterson, where the Newark Br. joined the old Erie Main Line. Since then, NJT has double tracked everything from Patterson Jct to Patterson, and smoothed out/adjusted the ROW somewhat in the process. Even back in the EL days, the several miles of single track from Patterson Jct to Patterson was a pita bottleneck. Old Newark Br still joins the Post 1963 main Line at Patterson Jct, as it has since 1963. Interesting. If you look at my pictures from my trip to Carlton Hill, youll see that just before where the rails end in a dirt pile (as close to the river as they go), the two rails go to one. However the images ive seen on the EL mailing list of the bridge indicate that it was two tracks. Were single track bridges common? If that factory there (I can't remember the name of it) had a siding, especially a double ended siding, it would be easier for the tracks to come together and have a single track at the end of the active track, so the locomotive could run around the train. it would pull down the branch, and depending on the siding layout, but would basically cut away from the cars,leave them on the "second track" then run to the end of track (single track) then come back east to work the sidings from the east end,or maybe that "second main" was used as a siding later on. I dont know if that was actually done there, but my point is just because it ends with single track stub now, doesn't mean it was that way when service was cut and the line abandoned from that point over the bridge. AFAIK, the bridge over the river just west of Carlton Hill was always double track....and it was taken OOS with the 1963 re-alignment. there was passenger service on the branch up till 1966, and no push-pulls. Rs-3's and stillwells. Well there is double track, plus all the side lines going off, along the lines. I seem to recall two sets of rails going over Jackson Ave. It is only at that very end that it is single. Where the station stood, it was double track wit a side track slightly lower, right next to the factory. There were a few other side tracks further along. JHZR2 wrote: Well there is double track, plus all the side lines going off, along the lines. I seem to recall two sets of rails going over Jackson Ave.
OK here's the deal. I just looked in my April 1966 ELK Emp tt. Hardly any mention is made of the Carlton Hill branch, other than it was only .7 miles, and that the whole branch was covered by yard limits. That probably means that all trains operated at 15 or 20 MPH, prepared to stop short of train or obstruction. It was only .7 miles, so no need for speed. No mention of how many tracks, but up through at least 1966, there were 4 tracks HX to BJ (rutherford jct)...2 tracks on the right went to Ridgewood Jct, and the 2 tracks on the left went to Carlton Hill. After 1966 sometime, HX to BJ was reduced to 2 tracks, CTC, and what was left of BJ (2 crossovers) was remoted to the operator at HX. Only 1 track was left connecting from the BC line to Carlton Hill, with a electrically locked hand throw switch. I'm sure it was single track for a short while, and to 2 tracks till the run around switch at the end. The EL was never big about pulling up rail, so I'm sure they just left the orig 2 tracks there....especially if there were industries on both sides of the row. Remember, this whole thing was only a little over a half mile, so it didn't get much attention, until it was all pulled out, years later. pdtrains wrote: OK here's the deal. I just looked in my April 1966 ELK Emp tt. ... The EL was never big about pulling up rail, so I'm sure they just left the orig 2 tracks there....especially if there were industries on both sides of the row. Remember, this whole thing was only a little over a half mile, so it didn't get much attention, until it was all pulled out, years later. Only ever industry on one side. The other side has been a street/homes and Memorial Field in Rutherford since at least the mid-1950s. If you're going to be wandering around on that old ROW west of Jackson Ave, watch out. Last time I was down there, I found out the hard way that it's full of poison ivy. Not to mention extremely aggressive guard dogs that get through the fence just opposite where the tennis courts are. I used to go there to pull date nails, no way these days!! Shalom wrote: If you're going to be wandering around on that old ROW west of Jackson Ave, watch out. Last time I was down there, I found out the hard way that it's full of poison ivy. The west side, towards the river, is where I was. I walked all the way to the river. No poison ivy, they are actively working to make it walkable and visitable. So is the rail still in place or partly so West of Carlton Ave? If so, should be still some great old date nails from the 20's -40's. Aerial views show tank car/s on a spur just west of the old Standard Bleachery Co. - Carlton Hill, factory, and box cars at the Standard Bleachery loading dock. http://www.historicaerials.com/ 1954-1979 views. Runaround track at west end still very much evident and in use at those time periods. CarterB wrote: So is the rail still in place or partly so West of Carlton Ave? If so, should be still some great old date nails from the 20's -40's. Neat site! Cant tell from the resolution of the images if it went to one track at some time back then or not. It is definitely double track per my pictures, up until the point where they come together into one and go into the dirt pile that I suppose was the start of the bridge. The track is fully there from Jackson Ave to the dirt pile. In fact, active efforts are improving the area. Most all of the rail is marked Lackawanna 1940.